Hi everyone! I hope you’re having a great weekend so far 🙂 A little while ago, I reviewed the FUN Lacquer 4 Seasons Spring Thermal Collection (see my post here). 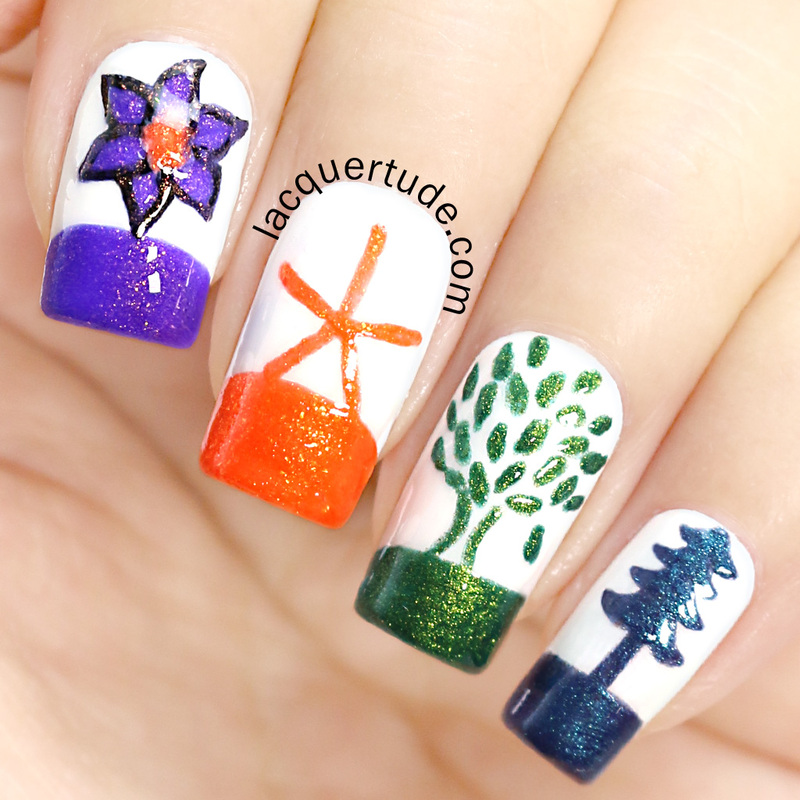 I fell in love with the entire collection and today I’m back with quick post of a “Four Seasons Nail Art” inspired by this collection. 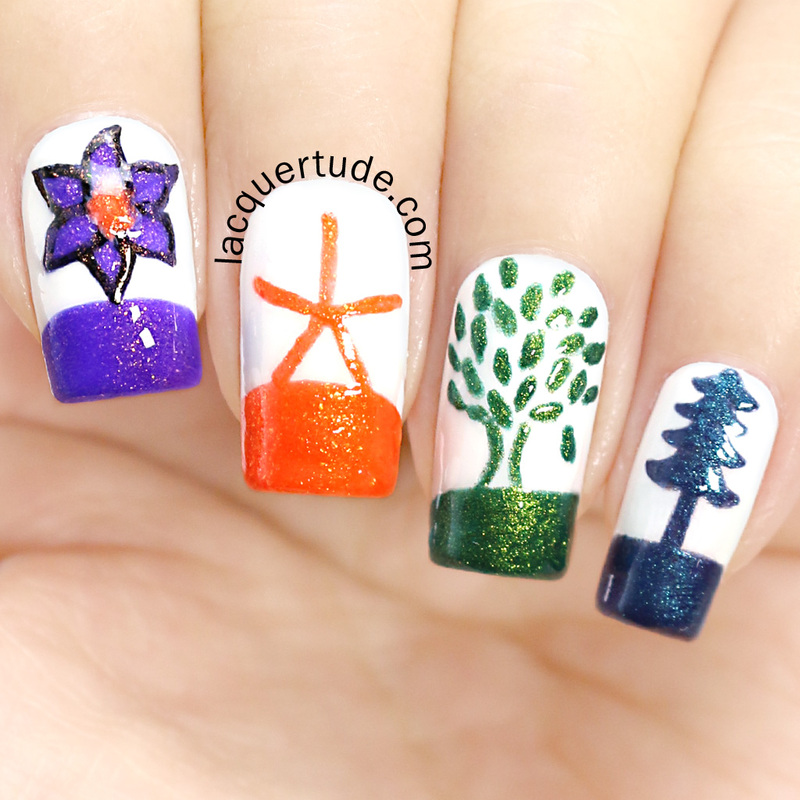 Each nail features one of the 4 shades, representing the seasons of the year. For my funky colorful “French tips”, I simply used the polish brush to sweep on the “seasonal earth” with the coordinating shade. Since I’m normally a perfectionist and outline and repaint every line and shape, this was such a freeing experience, to just “brush on” the earth in a random direction. Every nail tip has a different shape and each only took me seconds to paint! I started with one coat of white base from Born Pretty Store BK Matte Polish Line #13. I purchased it ages ago and recently decided to try it as an undie for my nail art. I was pleasantly surprised that it covered my nails in just one coat! I haven’t tried it yet, but I have a feeling that it’ll work well for stamping too. It is a matte polish, so it’ll dry to a dull finish. It doesn’t bother me at all since I always top coat my nails. But I thought I’d let you know. If you’re on the market for an opaque, fast drying white polish, you can find it here and use my 10% OFF Coupon Code “BKJ61″ – It’s valid for most products that’s not on sale. But be warned, if you’re like me, you can easily spend hours on their site! Δ Middle: FUN Lacquer ‘Sandcastle‘ – representing Summer, I immediately thought of the sun and the beach. One of my favorite activities that I enjoy yet never seem to have enough time for, is beach combing. And I always LOVE spoting sea stars. So, given the bright and cheerful orange color, I painted a simple sea star using a thin striping brush. Δ Ring: FUN Lacquer ‘Do You Be-Leaf In Magic‘ – representing Autumn. This was pretty straight forward. I painted little oval shapes for tree leaves! Δ Pinky: FUN Lacquer ‘ Fall To Winter‘ – representing Winter. On the West Coast of Canada, late fall to winter is often a somewhat melancholy time, characterized by overcast and misty skies. Sometimes it’s down right dreary, but when I’m in a peaceful mood, I see the romantic side of the West Coast winter weather, where the evergreen trees are dark yet strong, often decorated with fresh rain drops. Well, the smokey blue shade was the perfect color to depict the tree seen in my mind’s eye. Although, I must admit that my painting skills cannot possibly capture the intricate details of God’s design. Here’s a quick bottle shot to remind you of each shade. And if you haven’t already, you can read my full swatch and review post of this entire collection here. I’m so impressed with how cohesive the 4 colors are together. There it is! I hope you enjoyed this nail art as much as I enjoyed painting it! Thank you so much for reading and see you all soon!